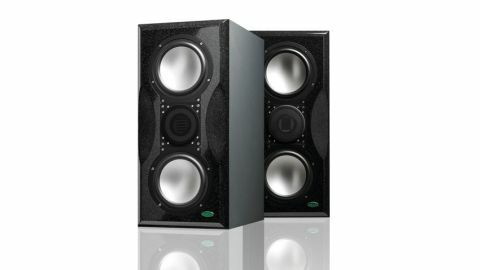 Big, bold and powerful, these are truly professional monitors - in the right room they will shine. An incredible listening experience. Astonishing bass response. Fabulous build quality. For monitors of this size, good room acoustics are essential. The first thing that you notice about Unity Audio's Boulder monitors is their sheer physical size. If you're used to studio mains they're not so big but in comparison to most near and mid-fields they are physically 'impressive'. "At 23kg each you need a pretty serious set of stands to hold them, and hopefully a willing friend to help you lift them into position"
The next thing you notice is the weight. At 23kg each you need a pretty serious set of stands to hold them, and hopefully a willing friend to help you lift them into position. As with sister model the Rocks, the cabinets are made from Baltic birch plywood and have a front baffle made of Corian. This front baffle has large radius edges to reduce reflections and the bass drivers are mounted symmetrically around the central coaxial mid/tweeter driver. Unlike many current monitors with dual bass drivers the Boulders are designed to stand vertically rather than horizontally. This makes more sense to us, as the drivers are all in one line so there is less chance of the stereo image becoming smeared. The other difference is that because of that coaxial driver the two bass drivers operate over the same frequency range. Power comes from the same 100W class A/B amplifiers that grace the Rocks, but this time there are four, one for each driver. This excellent Tim de Paravicini design is fast and clean and delivers one hell of a punch. Again, like the Rocks, the seven-inch bass drivers are made from 0.2mm aluminium foil bonded to a rigid pulp fibre cone. The big difference is in the mid/tweeter: a flat aluminium honeycomb midrange ring surrounding a folded ribbon tweeter. This gives a very wide dispersion angle while delivering everything above 450Hz as, to all intents and purposes, a point source. While the Rocks have no adjustment other than volume controls, on the back panel are the volume pots plus two switches. The first of these cuts and boosts a 10kHz shelf +/- 2.5dB, while the second is a mid cut/boost of +/- 2.5dB over 694Hz to 3.5kHz. On first listen we were somewhat taken aback by the sheer physical presence of the bass end and overall felt they were a little dull. Nipping around the back we boosted both the mid and HF and found that to be, for our tastes, much better, if a little strident around the 800Hz to 2kHz area. Eventually we settled on the mids set flat and the HF boosted. Our usual monitors have a lot of mid to high detail and the sound of the Boulders is naturally very different but we rapidly grew to appreciate the remarkable clarity and detail they have, particularly in the low end. "The ribbon tweeter particularly has a sweetness that other manufacturers would be well advised to take note of"
If you're used to big studio monitoring systems, that low end detail gives you a very defined picture of what is happening down there. For those who've only used nearfields, though, it can be pretty scary. The mids and highs can best be described as smooth. The ribbon tweeter particularly has a sweetness that other manufacturers would be well advised to take note of. Stereo imaging is excellent and they go very loud and stay absolutely clean. There's no increased harshness at high volume levels and the tonal balance remains at whatever level you set it at. Our only caveat is that when you go to a truly 'full range' monitor like the Boulders you must be very sure of your room. While close up nearfields can avoid some dodgy room acoustics, powerful midfields like the Boulders will show them up immediately. That said it would be well worth the effort in sorting out any acoustic problems - in the right environment the Boulders would deliver your mixes in style.